Loyal supporters are important for any business not only survive but to also thrive. Be it Coca-Cola or Pepsi, each brand has their loyal returning supporters. Ford vs. Chevy, for years parents all across the U.S. have raised their kids on one side or the other of the “truck fence”. Think Dallas Cowboys vs. Washington Redskins. New York Yankees or Los Angeles Dodgers. For my English football fans… is it Manchester United or Liverpool FC for you? These brands initially attracted our interest, then kept us by providing us with identity, entertainment, and valuable life moments. And at the end of the day – it doesn’t matter what brands or teams you support, the IMPORTANT part for whom you support, is that you SUPPORT. Dallas Cowboy fans purchase Cowboy gear, game tickets, and spend money at the Stadium which makes the Dallas Cowboys significant revenue. So as real estate agents, how do we develop loyal followers and that highly desired significant revenue that comes from a loyal group of supporters? When looking at the root of loyal support, the brand or team being supported is delivering an image or something of value to their supporters. The more they deliver that value, the more supporters they receive. So what can we deliver that will create followers that support and build a large referral book of business? Access to assessor, loan/transaction history, sales comparables? No. Understanding of what to consider before down-sizing? No. To build our Investor supporters… The location of distressed homes that may sell soon? No. I think all too often, real estate agents take for granted all we know, and all we have access to in this industry. One of the most valuable assets you have as an Agent is your knowledge about real estate itself, real estate terminology, real estate transactions and the real estate market around you. All of which is super valuable to homeowners. Be their resource and they will support you and your business – no different than Coke, Starbucks, or DirecTv. Think about it: Homeowners are constantly doing calculations on “What do I owe?” vs. “What’s my home worth?” The difference represents “money in the bank”. Zillow and similar sites have developed a poor reputation for delivering those answers. Homeowners don’t like paying property taxes – can you provide them knowledge on what an assessment is, and how to possibly lower their taxable assessments? Can you offer homeowners insight on what steps go into purchasing a second home or investment property? You are the real estate expert, Mr. Homeowner is not, and so you can better answer questions like these. And best yet, these opportunities represents the chance to meet homeowners so that you can get to know them. 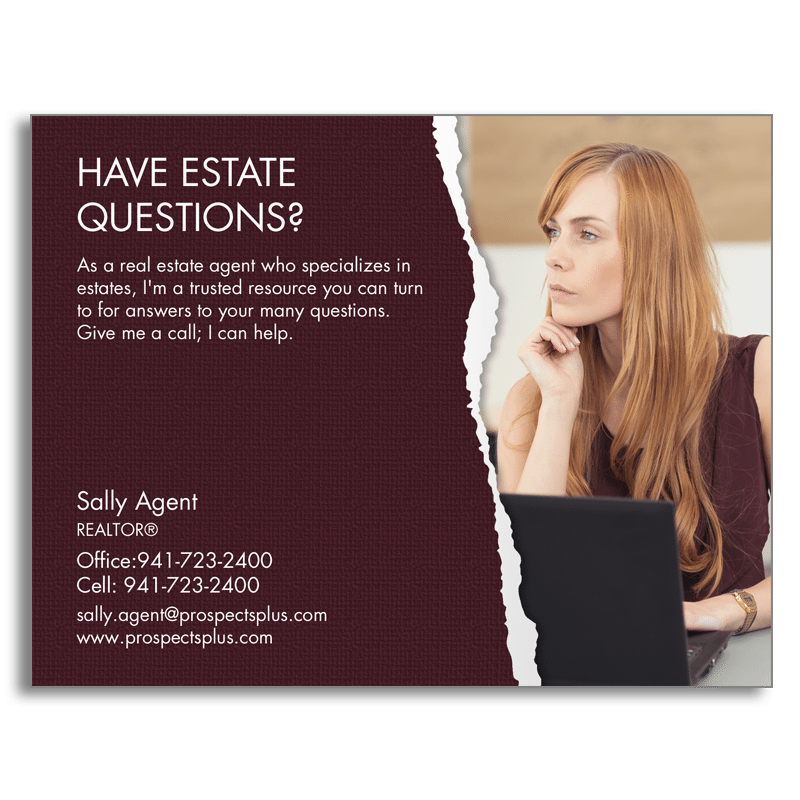 On your next postcard mailing… think about using a message like… “What’s your home worth?” – “I know, and I would love to help answer that for you”. “Considering Purchasing a Second Home? “Let me help you with understanding costs and qualifications”. “Property Taxes Too High?” “Let’s evaluate your assessed value vs. market value and see if we can lower them.” Important questions for homeowners, and valuable answers that you are best qualified to provide. ProspectsPLUS! 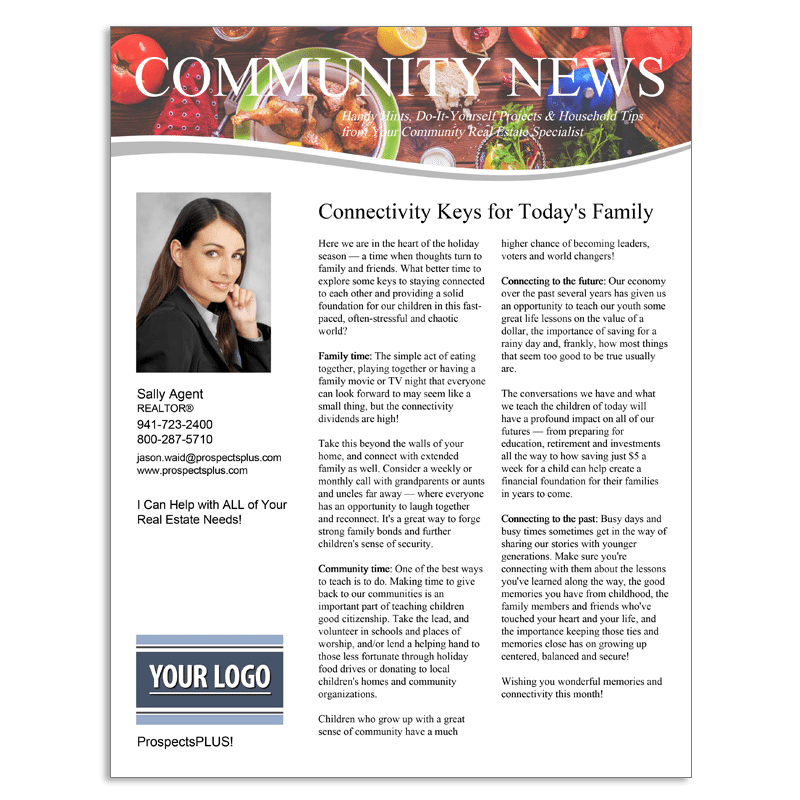 does a great job of providing the tools you can easily customize and send to get your message out such as their Call to Action series and their Neighborhood Update Series. To build a supporting group of Investor clients… What causes homeowners sell quickly with less desire to make top dollar in the sale of the home? For starters: Death, Divorce, Mortgage and tax defaults all lead to quick sales. And many times, they are distressed sales. When a homeowner passes away, the heirs tend to be more concerned with quick money from the sale of the home, more so than top dollar. Oh, and they don’t want to do home improvements prior to listing the home for sale – which add to the perfect opportunity for investor clients. Mortgage or tax defaults are similar… The default is an issue that creates a “quick sale” scenario that is way more important than receiving the highest price available in the sale. The result is the perfect opportunity for you and your investor supporters. These types of “life event” information (death, divorce, defaults) tied to property is not easy to locate – but for the agents that do, the opportunities are endless. Think about this in your next mailing… “Looking for off-market properties that have a high chance of selling quickly?” – I know where they are located. Next question: Who do you mail these types of postcards to? The mailing addresses of the investors that already own investment property in the immediate area. These folks already own investment property – so what better pool of folks to get to know with this valuable data that only you have? ProspectsPLUS! makes this messaging easy for you with their Life Events postcards that correspond to our data mining tools. Hopefully I am not the first to tell you…. when looking to deliver “items of value” to create a loyal group of supporters, it’s not a “hot cooking recipe” or “note pad” with your mug shot on it. Those are simply items that remind the homeowner you exist – but they don’t provide anything of significant value. I have never entertained making the “Spiced Rum Cake” that came in the mail from a Realtor – have you? But if you could help me locate an off-market property that I have a better chance of acquiring at a less than market price or if you could confidently tell me how much money I have in my “housing piggy bank” (equity) – I start to become your follower, your supporter, and I help you build your supporters via recommendations and referrals. As your loyal group of supporters builds… regular valuable information will be the key to keeping their support. Offer them pricing updates on their home, information on market trends based upon recent sales and recent listings – all information they want to know. Offer them off-market opportunities (from new “life events”) as new ones pop-up. It’s interesting and it’s valuable, and if they are interested in finding a great deal on another home – they will support you as their agent. As an Agent, you have access to some really great sets of information – use it. Need help using the postcard tools referenced in today’s post? Call our team at 866.405.3638 or visit our site today at www.prospectsplus.com. When you are looking for straight-talk strategies for building not just a business — but a successful book of business, it’s always a good idea to go to someone who not only knows how to help agents succeed at exceptional levels — but one who just tells it like it is. For that? I reached out to my old friend Darryl Davis. He’s an author, speaker, trainer, coach — and one of the funniest guys you can talk to. His analogies and ability to weave a story into a message are epic. It’s part of what makes him such an effective speaker – it’s also why I wanted to interview him for this topic! Q: Hey Darryl, thanks for sharing your insights with us again for this edition. Our focus this time around is really building a strong business base. Can you share some thoughts on that? A: Building a business? You know I’m a FSBO/Expired guy – but when we are talking about building a business foundation? Know that there are two types of contacts to focus on. 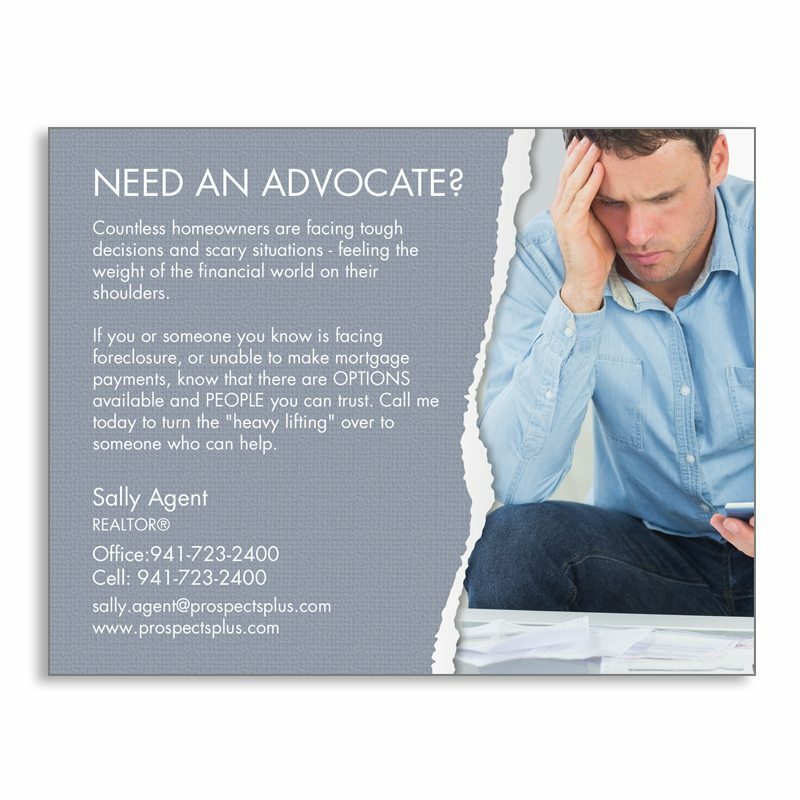 You’re building trust and establishing yourself as the agent to call. accountant. Hope things are going great! I’d love to hear from you if you need anything.” Wow – see you just saved them time and stress and made a contact that personal to them. Win-win-win. Stay top of mind with these folks by sending them something to help them stay connected to you and recognize that you’re there as a resource. And don’t be shy about picking up the phone and saying hello and asking if people need anything a couple times per year. Or creating opportunities to see them in person. Q: Darryl, I loved your message in our last magazine where you talked about listing INVENTORY being the name of the game, not just listings. Can you share a little more about that? A: What I’ve been teaching is that agents need to look at their business as if they were running a store. With a store, you’ve got a location, employees, and you’ve got to stock and manage your inventory. So, say you were selling candy? You must have enough candy on the shelves when customers come in right? Otherwise people are going to buy their candy somewhere else! So if you’re a real estate agent your inventory is real estate. I tell agents to make a chart January-December on the bottom and the numbers 0-20 on the left side. Next, plot it out. Say your goal is to get four listings per month and build your inventory. 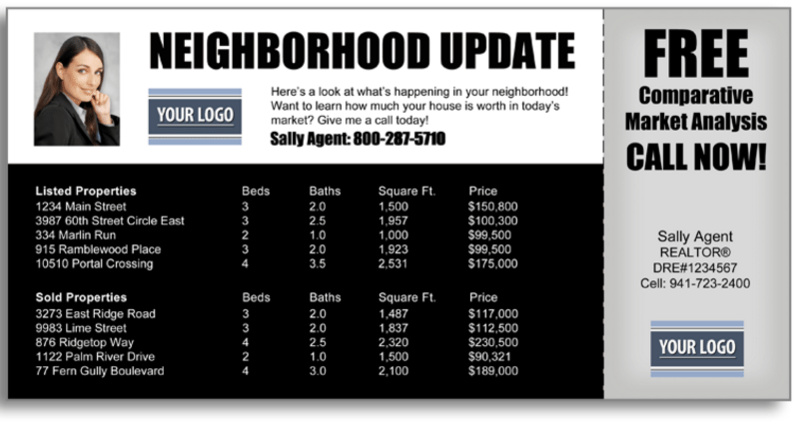 Now you have get four listings in January, but you sell two. You know you need to replace those two, plus get four more for February and so on. Creating a visual to see whether your graph is going up (the right direction) or down (further from your goals) helps you think like a business person. And that? Is a big key to success. Because there are a LOT of agents running around with a fly-by-the-seat-of-their-pants approach to their real estate career – which is fine if you want to always wonder where your next commission is coming from or if burn out is your thing. But top agents who want to be at this a long time and have a lot to show for it, understand that applying true business practices and mindsets is the win-win they need. Q: You hit the nail on the head. One topic that seems to come up a lot with agents is the idea that they just don’t have the time to focus on databases and marketing and details! What would your advice be in terms of time management? A: First, I would tell them to be crystal clear on their priorities. In real estate, it’s easy to get distracted with things that don’t forward your business. I’ll tell you a little story. There’s a woman named Rachel Lust who is a Hula Hooper. If you look her up on YouTube, you’ll see she has hundreds of thousands of views and likes. She did the halftime show for the Chicago Bulls. She is the most famous person in the world of hula hooping. She’s got a line of videos, hoops, clothes, you name it. Do you know what Rachel does for two hours a day, six days a week, no matter what? Yep. She Hula Hoops. Why? Because literally NOTHING else matters if she’s not good at her trade. It’s the same with agents. 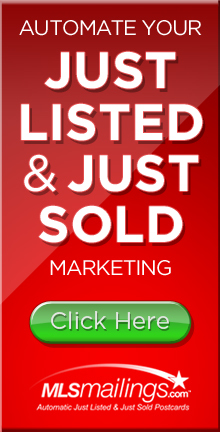 If you aren’t prospecting, looking for listing inventory, and taking new listings – the rest doesn’t matter. I’ll give you another example. I ran the NYC Marathon. Now here’s what you might not know about me: I HATE exercise. Hate it. Five days a week, I had to get up in the morning and run, and one day a week I had to cross train. For five months, I had to do this. Didn’t want to do it. Didn’t feel like doing it. It was uncomfortable. For me to meet this commitment I made, and log in the two hours of running every day, I had to get up two hours earlier to make it work. Here’s the thing: I couldn’t fit running into my life, I had to fit my life around the commitment to run. That’s how you’ve got to look at what it takes to make it at high levels in this business. You see the agents that say, “I’ll get to prospecting after I check my Facebook, and my emails, and my this or that.” Time management is not the problem there. Commitment is the problem. Everything you need to do lines up behind the commitment. Say you’re having a party. That means there’s cooking, cleaning, preparing all that has to be done. But you’re running late–right? Now you say you’ve got two hours of work to do in just thirty minutes. Do you do it? YES! That? Is a BREAKTHROUGH. Because when you REALLY have to get something done you do it. Manage your activities, and what dictates those activities is your commitment. People who are passionate about commitment don’t have time management issues. They are focused, clear, and committed. They don’t just do commitments – they are commitment. Q: What additional advice do you have for agents who want to really knock it out of the park this year in real estate? All of these moves take commitment, solid commitment. Figure out what you real commitment is. What you really want to accomplish, then let everything else line up behind that goal. I just caution you to make it more about the people – the lives you help – rather than the money. When you do it right and your passion is for the people you can help, the money comes. Awesome stuff Darryl. Thanks for sharing. If you’d like to learn more about Darryl’s training courses and products, please visit www.DarrylSpeaks.com – and read his bio below. Darryl became a real estate agent at the age of 19 and quickly climbed the ladder to become a top producer, averaging six transactions a month. He became a licensed broker and manager of a new office that became the #1 listing and selling branch within its first 6 months of operation. He’s been named one of the highest-rated speakers at the National Association of REALTORS® convention for the past several years and is the ONLY real estate speaker who is a best-selling author with McGraw-Hill Publishing for his book, How to Become a Power Agent in Real Estate. He is the founder of The POWER Program®, a yearlong real estate coaching program that has proven results of agents doubling their income over their previous year. He’s also the creator of the nationally acclaimed three-day program S.U.R.E. Results, where agents generate an average of $33,504.82 over their previous year. And as creator of the nationally recognized term “Next Level®,” Darryl strives to bring his students and attendees to their “Next Level®” of success by training them on how to have more fun and less stress in their business and personal lives. To learn more about Darryl and his training tools and services, visit www.DarrylSpeaks.com, or contact him at 1-800-395-3905. To learn more about staying in consistent touch with your sphere and farm (as Darryl teaches), visit www.prospectsplus.com, or call our support team at 866.405.3638 today. Sphere, Farm, Niche – it’s the real estate agent’s version of lather, rinse, and repeat. Success in this business stems from staying in touch, staying positioned, and top of mind for the folks in all three. I’m often asked by agents, “Where do I start?” The obvious is ‘the sphere’, aka – your sphere of influence or book of business. Now, if I had a dollar for every agent that said ‘no” when asked if they had ever taken the time to actually put their sphere (those people that already know you, like you, trust you, and would do business with you) into a database, I could buy a very large piece of property – like an island or something! So don’t let yourself fall into THAT category! Savvy agents understand that their best customers, are the ones they’ve built and nurtured relationships with consistently. Who should be in in your sphere? Family, friends, neighbors, colleagues, past clients – and all those folks whose lives you touch and touch yours back. 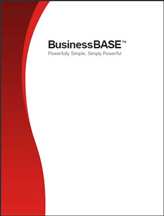 Sphere: For a list of 250 people that SHOULD be in your book of business, download a pdf of our BusinessBASETM at no cost today. Then make THIS the week you make putting YOUR sphere into a working, viable, referral-generating database. Need help inputting all the data? There are lots of college students home for the summer already that would be perfect for that kind of task. Or hire a Virtual Assistant for the project. Your highest and best use of time is prospecting, presenting, and closing – so gather up the data – and delegate it to someone to make it happen. Holiday postcards – there’s something every month that can be sent as a friendly hello. 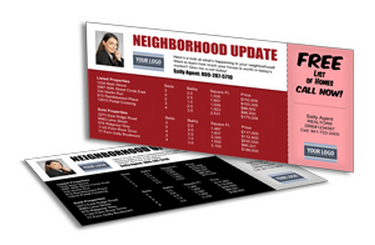 Recipe cards – many agents swear by these as customer ‘keepers’. 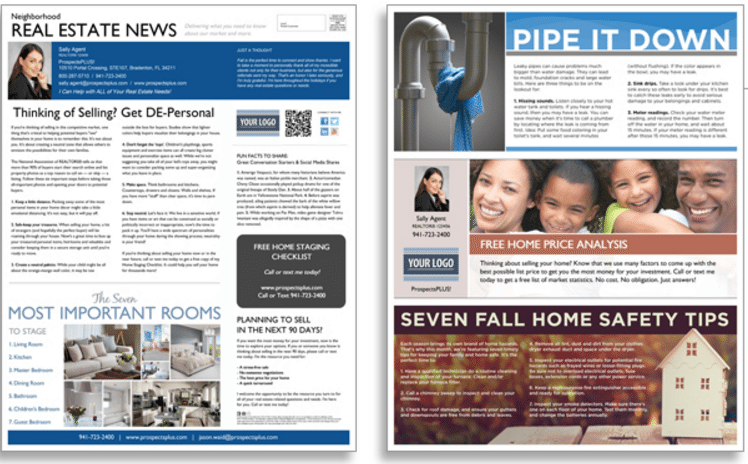 Newsletters – these powerful tools are perfect for connecting with your sphere. Content cards – these are content-rich, consumer-friendly postcards filled to the brim with valuable information that people love. Farm: Pick an area – but not just ANY area. I asked Coach Todd Robertson for a little how-to advice for agents on choosing the right farm area for them. He shared, “I work with a lot of agents to help them really fine tune what area they want to market. Even if you find a geographic farm that you think works for you location wise with commission-friendly price ranges, you still need to be mindful of two other factors: The turn-over rate, and the competition. Ideally, we want to help position you to receive a 20% market share in a geo farm. If you start in a farm where another agent already has that or higher, you’re going to work much harder and have to be at it longer to see the results you’re seeking. Finding an area where any one agent has less than 10% market share is preferable, or if you see an area where a previously aggressive agent has slowed or stopped their marketing. In terms of turnover rate, ideally you want a one that is at least 10-15%. You can easily determine the turnover rate by dividing the number of homes in the farm by the number of homes which have sold.” That’s a great starting point. 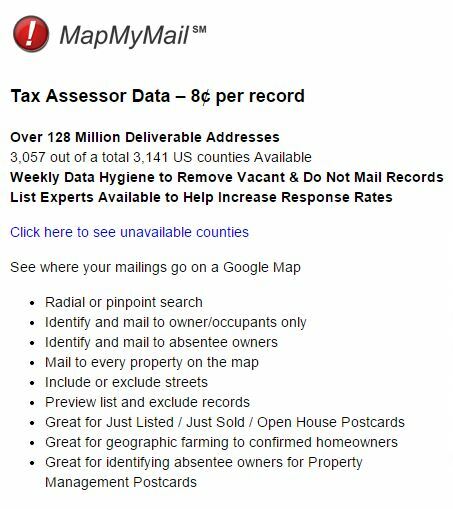 So take a snapshot of your market area – look at the neighborhoods that may fit that criteria close to you, then use our MapMyMailSM system to easily capture mailings lists from those areas. You can choose a radial search by address, or choose to search by zip code or counties. Talk to your broker, look at your options – then map out your marketing list! Once you have that – then remember to stay CONSISTENTLY in touch with these folks – month after month. For a great read and more tips from Todd – read The Smart Scoop on Geographic Farming. Neighborhood Update/Free Offer series: People want two things: to know the agent they work with can get results – and that they have the resources they need. These cards present you as the agent with both! 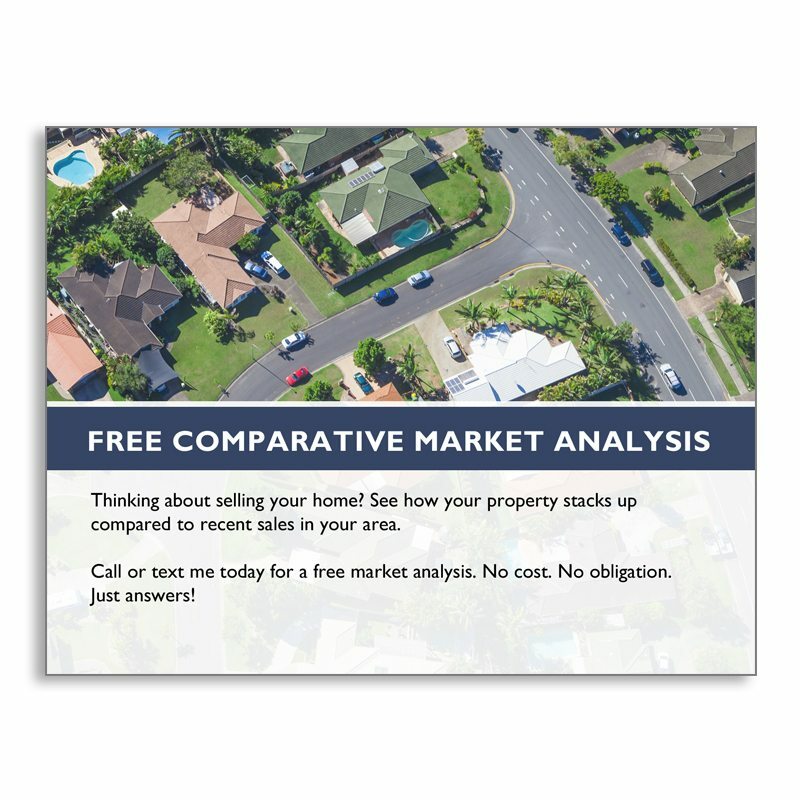 Listing Inventory Series: These postcards speak to the mindset of potential sellers with the right questions and direct response offers. The Market Dominator: For agents serious about dominating a geographic farm and earning a 20% market share. This powerful, direct-response piece is 12×15 and attention grabbing. 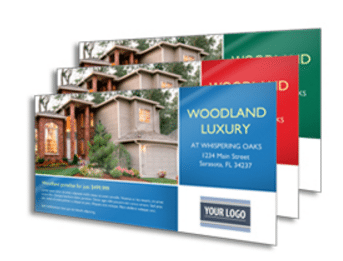 It also takes advantage of Every Door Direct Mail, so the cost is even more affordable. Niche: Top agents don’t stop at just marketing to a sphere and farm. They specialize in a demographic that resonates with them. 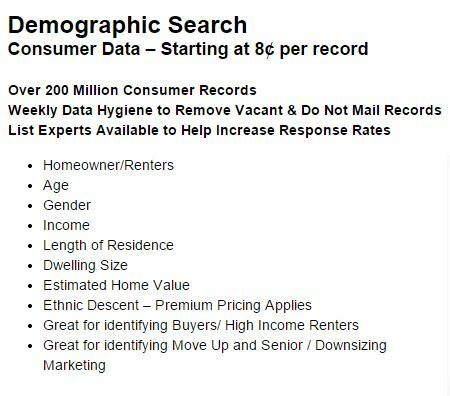 Investors: Use our MapMyMailSM – choose the demographic search option, then custom, then choose records with a household income of $150,000 or higher. 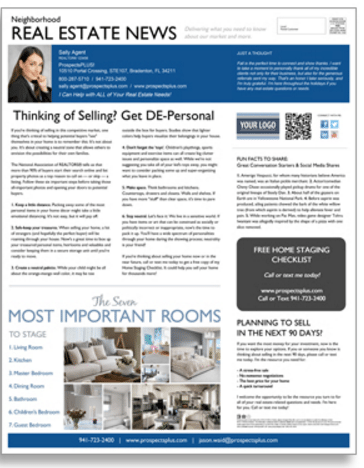 You can also look for REI or REIA websites to learn more about real estate investors. Use our Investor Series postcards to reach out to these lists each month. FSBOS & Expireds: There are great services such as LandVoice that offer data for FSBOs & Expireds in market areas all across North America. 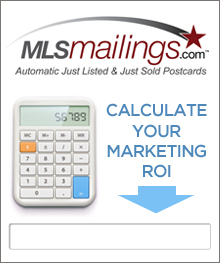 Use our 7 Series for FSBOs or Expireds – send 3-7 postcards in rapid succession (every 3-5 days) as soon as you see a new prospect for these demographics, offer a free report such as 5 Factors That Cause a Property Not to Sell, and follow up after you’ve sent the postcards with a direct response offer. Offer to perform a Merchandising Review to ensure that the home gets sold for the best possible price in the fastest possible time. First Time Home Buyers: Use the MapMyMailSM system to find local renters. 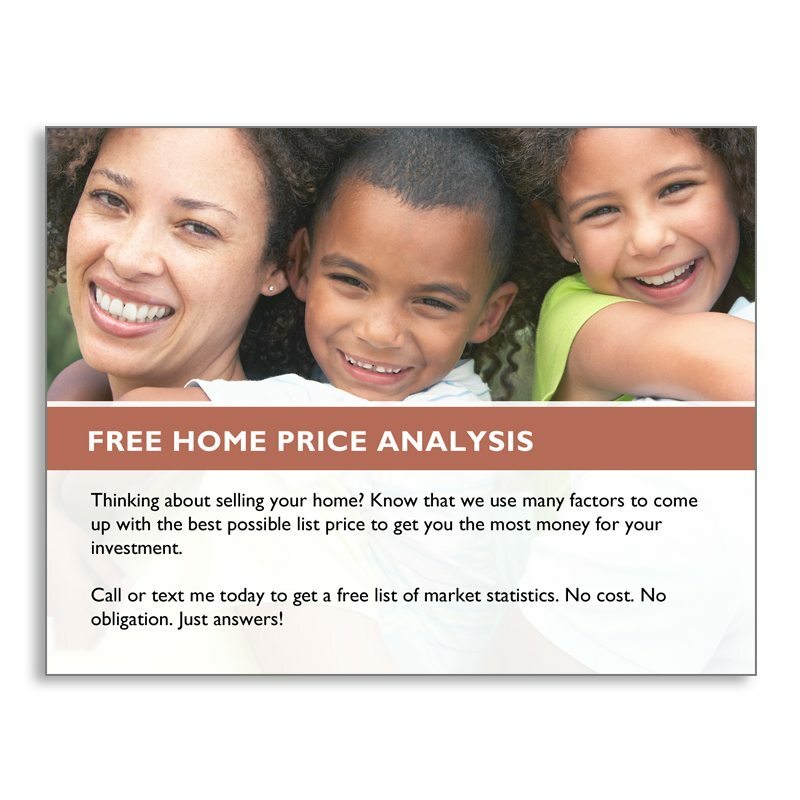 Offer a variety of free reports such as How to Save for a Down Payment, or Top Ten Checklist for Choosing an Agent. Send our First time home buyer/renter series of postcards monthly with a fair trade offer to connect. Seniors: You can use that same MapMyMailSM technology to find Baby Boomers and older. Send our Senior series of postcards to these fine folks! Get creative: From motorcycle enthusiasts, to local sports team members, to boaters, to farmers, and everything in between. Finding the group of people that you really connect with and would love to serve and work with is a great way to get continuously better as an agent and build a powerful referral network. 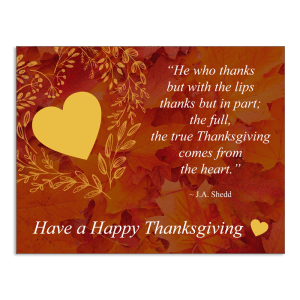 You can edit our holiday, inspiration, recipe, content cards, or even image series to alter your message for each and every demographic. Smart, right? 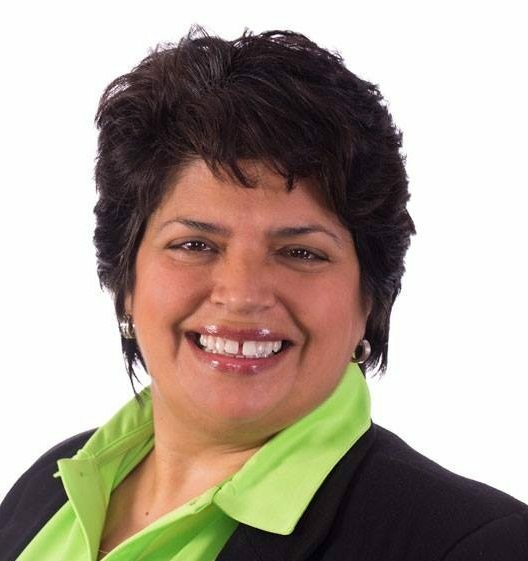 So what does that mean to YOU as a real estate professional? It means that marketing just got more interesting. See our Nielsen PRIZM options here. 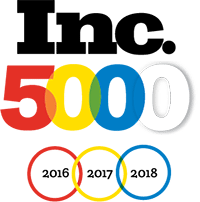 For all three marketing avenues – your sphere, farm, and niche – be sure to connect every 28-45 days consistently to ensure that you maintain that top-of-mind awareness. Armed with your database and marketing materials, and a reminder system to FOLLOW up with the folks in each will give you the competitive edge in your market that will allow you to develop and maintain a long and prosperous career. Ready, set – GO! Need help getting started? Contact our marketing professionals today at 866.405.3638. They are an amazing resource – and they truly care about your success. Happy Listing!